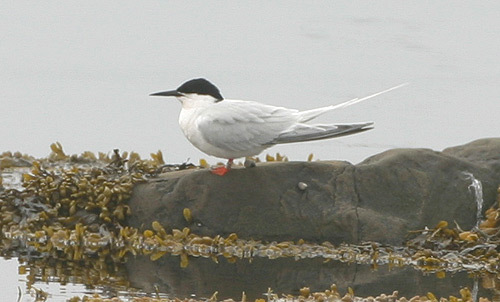 This Roseate Tern was the first sight record for Newfoundland – hanging out in Trepassey on June 11, 2006.. Origins: Breeds along the Atlantic coasts of North America (New England, Quebec, Nova Scotia) and Europe as well as the Caribbean, wintering further south. Record Details: Three sight records for Newfoundland. (1) The first was in Trepassey on June 11, 2006. (2) Another was confidently reported by a tour group in Renews on July 7, 2008 but never relocated. (3) An individual was photographed at Bear Cove (south of Renews) on July 9, 2018. Possibly the same bird was relocated at Trepassey July 17-19, 2018. It was banded, but details could not be read. Two band returns for this species were also submitted from the Burin Peninsula some years ago, although there is some question to their veracity since they were apparently of birds banded by students in a mixed tern colony (pers comm). Intriguing, nonetheless.